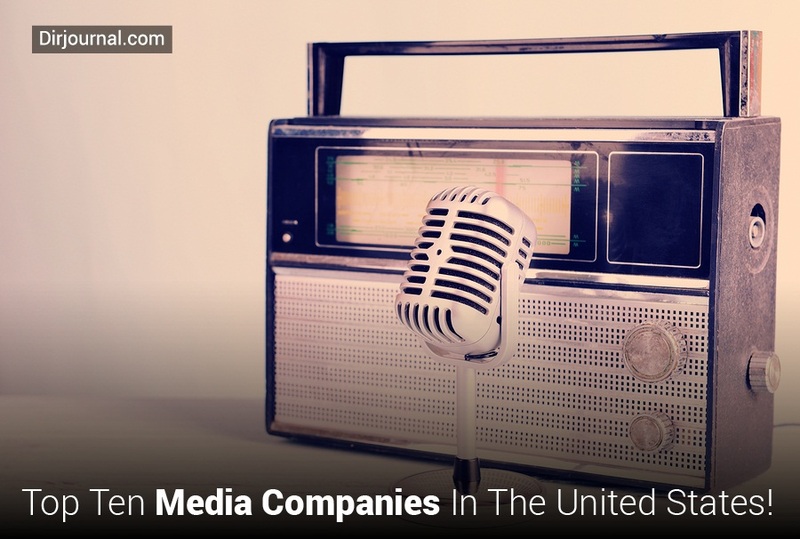 Home Business Top Ten Media Companies In The United States! The mass media forms the image of the world for us and tell us what to think about that image. Essentially, everything we know comes to us via our newspapers, magazines, radio or television. The manipulating techniques of media masters come across in the way some items are played down while some others are emphasized by their choice of words, tone of voice, facial expressions, headlines and the choice of illustrations – all these things subliminally and subtly affect the way we interpret what we see or hear. The overall revenue of the top ten media, entertainment and communications companies rose to a whopping $59.9 billion and this huge increase from the previous years is attributed to the strong demand for digital services, acquisitions, operating efficiencies and favorable exchange rates. Another interesting factor to note is that the media is largely dominated by Jews. Who are these powerful media Moguls that mould American minds? Media Giant, Time Warner with $46.48 billion in revenue is the largest media conglomerate and was founded by Jewish Warner brothers in the last century. It was formerly three companies: Warner Communications, Inc, Time Inc. and America Online, Inc. The Time-Warner merger took place in 1990. The company reached this stage when it was bought by America Online for $160 billion in 2000. AOL is the largest internet service provider in the world with more than 34 million U.S. subscribers and Time Warner was the second largest of the international media companies when it merged. The combined company’s revenue was $39.5 billion in 2003. With this merger, Gerald Levin, a Jew, became the CEO and Steve Case, a Gentile, became the chairman for AOL-Time Warner. Then AOL went into losses, and the name AOL was dropped in 2003 and Richard Parsons replaced Steve Case. In spite of several such hiccups, Time Warner emerged successful and is now at the very top of media companies. It will be launching a trial of “TV Everywhere” very soon, which will allow its subscribers to access content on mobile devices and PCs. Rupert Murdoch’s News Corporation owns Fox Television Network, Fox News, the FX Channel, 20th Century Fox Films, Fox 2000, and publisher Harper Collins. News Corp. is one of the largest mega media corporations in the nation, with revenue of approximately $32.9 billion. Almost 70% of its sales come from its US businesses. Initially incorporated in South Australia, News Corporation was re-incorporated in Delaware in 2004. For the first time ever, media mogul, Rupert Murdoch has been overtaken by his son, James, in the list of the most popular figures in British media. However, Murdoch’s stance on charging for online news content access, in an attempt to keep newspapers profitable, what with the falling ad revenues and subscriptions, has been met with sharp criticism from various quarters, including the blogging community who advocate free content availability. The Walt Disney Company with revenue of $37.8 billion is a large media conglomerate, founded on October 16, 1923 by the Disney brothers, Walt and Roy Disney. Initially, it was started as a simple animation studio but went on to become one of the biggest Hollywood studios. Led by CEO Robert Eiger, it now includes several television production companies, cable networks, motion pictures and theme parks. Earlier, when the company was run by the Disney family before the takeover by Eisner in 1984, it epitomized wholesome family entertainment, like Snow White. After its takeover, there has been a shift towards a great deal of “adult” material. Disney’s practices have prompted action from several religious welfare groups from around the world. For example, their productions, Priest and Dogma were embroiled in huge controversies over offensive material. Films such as The Lion King, Aladdin and a few others attracted attention as they were said to contain subliminal messages. In spite of all the controversies, the Walt Disney Company continues to grow at a wonderful pace. The nation’s largest cable provider for broadband cable networks is founded by Ralph J. Roberts, Julian A. Brodsky and Daniel Aaron in 1963. With current revenue of $30.8 billion, this has been a success story ever since its inception. The company now has more than 24 million cable customers, about 15 million high-speed internet customers and 6.5 million voice customers. Comcast manages to retain consumers through the increases in prices, by offering flexibility with a number of choices. Comcast is not just a cable service provider, it also produces content, and owns E! Entertainment Television, ten Comcast Sportsnet networks, e-newsletter Daily Candy and the Golf Channel, and CEO, Brian Roberts says they are planning on growing the content business. Operating from Googleplex, their headquarters in California, Google have achieved the feat of being the most valuable media company, topping the list for brand value, at $100 billion, and boasts of revenue of $21.7 billion. It was co-founded by Larry Page and Sergey Bin in 1998 when they were both students at Stanford University. From the humble beginnings to having more than 20 thousand employees is worthy of praise. The company’s revenue comes from advertising related to internet search, online mapping, email, social networking and video sharing services. A recent study revealed that Google accounted for 72.74% of all US searches in a 4-week period, which speaks for the huge popularity it enjoys. In a landmark agreement, Google and Fox Interactive Media of News Corp. entered into an agreement of US$900 million, to provide search and advertising on MySpace. DirecTV Group, which was earlier Hughes Electronics, with $4.9 billion revenue, is one of the leading providers of direct broadcast satellite television to US customers in businesses and homes. It is also a provider of multichannel video programming distribution in the United States. Through its subsidiaries and affiliated companies not only in the United States but also in Mexico, Brazil and other countries in Latin America, the company provides digital television service to more than 18 million customers in the United States and about 5.8 million customers in Latin America. The company also extends its services to providing high definition (HD) local channels and national television channels to some markets. With its headquarters in El Segundo, California and with more than 11,000 employees, the company is going places. This company was founded by Charlie Ergen and began its operations as a service of EchoStar, and then went on to launch its very own satellite in 1995. It then established its brand name, Dish Network to start marketing its home satellite. EchoStar, in 2008, divided into two different businesses, EchoStar Broadcasting Corporation and Dish Network Corporation. Dish Network, which is the larger company, concentrates on US-based marketing of satellite television and EchoStar takes care of the satellite fleet and other signal infrastructure. Its main rival today is DirecTV Group but the company has gained recognition as being the best. CBS Corporation is a mass media company with operations in the United States and internationally. It operates the CBS Television Network and about 40 broadcast television stations and 15 of the top 20 US markets, including 21 stations owned and operated by CBS. The CEO is Leslie Moonves and Chairman, Sumner Redstone, is the owner of National Amusements and a majority shareholder. CBS was formed in 2005, when the old Viacom split into two different companies; New Viacom and CBS Corp. In 1985, when Ted Turner made a bid to buy CBS, there was panic in the media boardrooms all over the country. Turner was a Gentile (a term used to refer to non-Jews) and although, he never showed any resentment towards Jews, he was regarded by the Jews at CBS as someone who might turn against them in the future. To spoil Turner’s bid, executives at CBS invited Laurence Tisch, a Jewish billionaire, for a friendly takeover of CBS. For almost ten years from 1986, Tisch was the chairman and CEO of CBS, until finally 20 percent of CBS stock was owned by Time Warner. Even with so much going on behind the scenes, for almost 50 years, CBS has been shaping broadcast media and has experienced tremendous growth over the years, with current revenue of 13.9 billion. It has established itself as one of the leading media companies. More than twenty years ago, in 1986, the merger of powerhouse BBDO and DDB Needham advertising agency networks shook the advertising world. This merger is also referred to as the “Big-Bang” merger. Under the leadership of CEO John Wren, Omnicom has become the number one holding company in the world today. As a world leader in global marketing and corporate communications holding company, Omnicom’s major holdings include DDB Worldwide, BBDO, TBWA Worldwide advertising agency networks. It is the biggest player in nontraditional marketing, from public relations, healthcare marketing and sales promotion to new disciplines such as interactive marketing and media buying services. Given Omnicom’s track record of awards, it is no surprise that it stands as a top media company and it is safe to bet that it will be on top of whatever the new wave of media brings. Viacom, headed by Sumner Redstone, a Jew, is one of the top ten media companies. Viacom produces and distributes TV programs for three largest networks, owns 39 television stations, owns 185 radio stations in the Infinity radio group, as well as having more than 1,500 affiliated stations through the CBS Radio Network. Viacom also produces feature films through Paramount Pictures. This company was formed in 1971, and its chief claim to fame is as the world’s largest provider of cable programming through its MTV, Showtime, Black Entertainment Television, Nickelodeon and other networks. As we all know, MTV dominates the television market for viewers between the ages of 12 and 24. Viacom is the largest outdoor advertising (bill boards) entity in the United States and also owns Country Music television and Nashville Network cable channel. It is also involved in satellite broadcasting, video games and theme parks. There is no greater power in this world today than mass media of news and entertainment, which is the power that shapes every citizen, irrespective of caste or creed; rich or poor. You wouldn’t be just a little bit anti-Semitic now would you??? I don’t see Clear Channel Media + Entertainment. That mean this list is useless. Look it up folks.